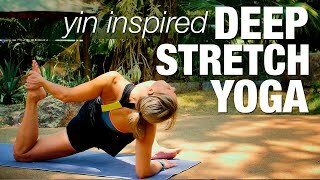 A strong power yoga workout to recharge and revitalize body, mind and spirit! This intermediate power yoga workout class stretches and strengthens your whole body and includes sun salutations, upper back and shoulder opening, low back and core work, hip and hamstring stretches, as well as philosophy, breath work and meditation. Michelle Goldstein teaches this dynamic 60 minute power yoga class.